- Publisher A constructive theology and ethics of money in the Christian life, this series addition is by James Hudnut-Beumler, dean and associate professor of religion and culture at Columbia Theological Seminary, and deals with vital questions. "What does the Lord require? what is the true meaning of the term 'commonwealth?' and how does the church build a stable base for its members to live ethical lives?" A positive approach to forming the basis for new thought and discussion. - Publisher The Alban Institute expands its look at how congregations tackle the issue of money as it relates to faith and lifestyles. Several renowned experts offer fresh perspectives on various aspects of this issue, with innovative ideas and solutions for congregations and their leaders. Along with previous Money, Faith, and Lifestyle titles, the new series entries offer something for everyone concerned about this most pressing issue.^A constructive theology and ethics of money in the Christian life, this series addition is by James Hudnut-Beumler, dean of the Divinity School at Vanderbilt University, and deals with vital questions. "What does the Lord require? What is the true meaning of the term 'commonwealth?' How does the church build a stable base for its members to live ethical lives?" A positive approach to forming the basis for new thought and discussion. 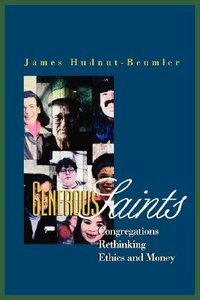 About "Generous Saints: Congregations Rethinking Ethics and Money"
A constructive theology and ethics of money in the Christian life, this series addition is by James Hudnut-Beumler, dean and associate professor of religion and culture at Columbia Theological Seminary, and deals with vital questions. "What does the Lord require? what is the true meaning of the term 'commonwealth?' and how does the church build a stable base for its members to live ethical lives?" A positive approach to forming the basis for new thought and discussion. The Alban Institute expands its look at how congregations tackle the issue of money as it relates to faith and lifestyles. Several renowned experts offer fresh perspectives on various aspects of this issue, with innovative ideas and solutions for congregations and their leaders. Along with previous Money, Faith, and Lifestyle titles, the new series entries offer something for everyone concerned about this most pressing issue.^A constructive theology and ethics of money in the Christian life, this series addition is by James Hudnut-Beumler, dean of the Divinity School at Vanderbilt University, and deals with vital questions. "What does the Lord require? What is the true meaning of the term 'commonwealth?' How does the church build a stable base for its members to live ethical lives?" A positive approach to forming the basis for new thought and discussion.